To view LIVE Broadcasts from an iPhone mobile device has been the holy grail of broadcasting networks and business worldwide. 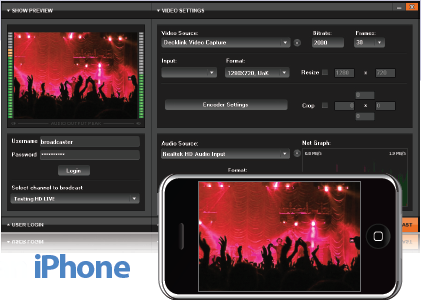 Eyepartner has developed a simple software kit –TikiLIVE iPhone Broadcaster – that makes it easy for anyone to view high quality broadcasts originating from an off the shelf PC; no technical skills required. The TikiLIVE iPhone Broadcaster, based on a patent pending streaming technology, requires no proprietary hardware. It is designed to easily broadcast LIVE Events as well as Video On Demmand Content. It can be used to broadcast world premier movies, live concerts, TV Stations, Church services or corporate events that can all be viewered from an iPhone. “Now anyone can broadcast their high quality video to the mobile market, quickly, easily and without a large expense” Tim Green, president of Eyepartner, explains. Once downloaded, simply connect a video and audio source to the PC and click “Start Broadcast”. 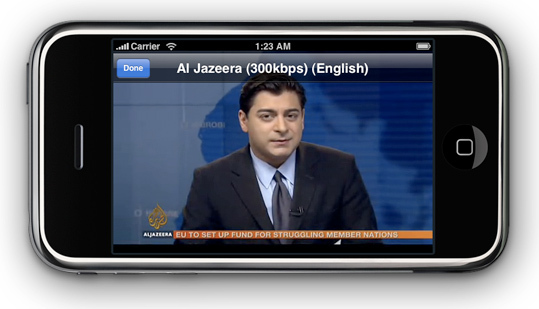 Once the broadcasting starts, viewers may find the broadcast by navigating to a uni que URL on their iPhone. So how does it work? Eyepartner offers simple the software download kit designed for an IBM PC with XP, Vista or Windows7 directly from their corporate websites. Simple “how-to” broadcast instructions will walk users through the process. Professional broadcasters and hobbyists alike have the ability to instantly send their iPhone URL to viewers. Once the broadcast has started the viewers will instantly be able to see and hear them LIVE directly from their iPhone. Each broadcast may be recorded to the TikiLIVE server network as a video on demmand and added to the TikiLIVE iPhone Broadcaster VOD gallery. Tim Green of Eyepartner, Inc.